On Thursday evening, I attended the #yegbikecoalition event at Edmonton’s City Hall. We were lucky to have some fantastic speakers to help launch the event. Scott McKeen regaled us with his memories of biking from Clareview to downtown Edmonton, and accordingly some of his reflections on “sharing” the road with drivers. Andrew Knack shared his new found passion for winter cycling. Todd Babiak spoke to the issue of cars vs bikes and made the insightful point that we aren’t a car city, that we’re a “city city”. I was particularly moved by a speech made by the 8 year old daughter of Anna Ho, one of the #yegbikecoalition members. She spoke about how by biking to school that she is able to stop to say hi to friends, observe wildlife, and race cars on the Saskatchewan Drive bike path. She shared that she would bike in the winter time, but is not allowed. Not because it’s too cold out (she smartly pointed out that if we can ski in the winter we can certainly bike), but because the roads are too dangerous with cars and ice. She said that her parents would allow her if there were separated bike lanes. Beyond being completely floored by her speech, I was reminded that bike lanes are important for people from all age groups and all backgrounds – not just hip, urban dwelling 20 somethings. People of all types showed up to the event which I think indicates that bike lanes are beneficial for everyone. This is an issue that I am very invested in. I wish that I could attend the public hearing on Monday to share my thoughts, but I will be teaching at MacEwan that day and am not able to take the day off as the semester is coming to an end and time is of the essence. In place of my absence at the hearing, I thought I’d briefly share a few of my points on my blog – points that I hope are heard by City Council. I should emphasize that I want to share my views in a way that sparks productive dialogue. The message can get lost in the adversarial relationship that can too often take place between citizens and administration. The city is highly invested in increasing vibrancy in the downtown core. Edmonton’s downtown core has long been criticized as being “dead” and “boring”. Cyclists add to street life. They can easily get off their bikes and spend their money locally. 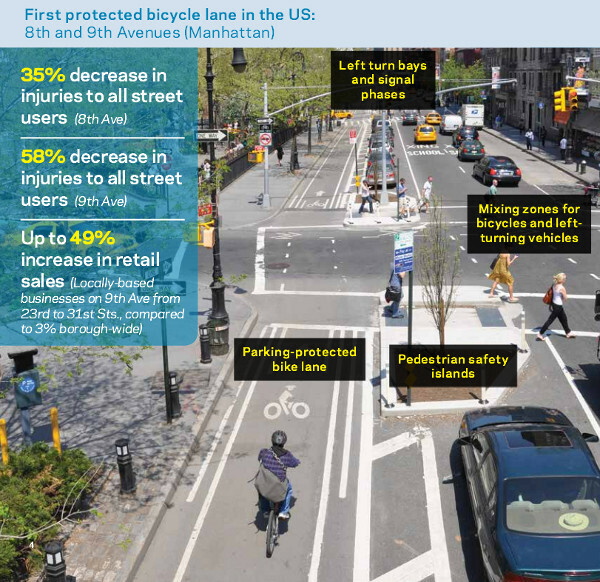 In New York, a study showed that business increased by 49% on a street where bike lanes were installed. Businesses play a huge role in promoting vibrancy. As downtown Edmonton welcomes more businesses, we will certainly need the people to be there to spend their money. Bike lanes make sense economically. As I had mentioned in my earlier blog post, bike lanes are also currently relevant for those who live in poverty. Owning a car can be prohibitively expensive, requiring those experiencing poverty (up to 12% of Edmontonians) to use alternate forms of transportation. We can’t ignore the fact that many people don’t have the means to use a car – our city should be built in a way that acknowledges this. Edmonton ‘s largest age group is 20-39 years old . Many young professionals are coming to Edmonton for the opportunities that exist here. Many of those people, including myself, have come from places with established bike lanes. We are doing an excellent job of attracting people, but are we doing enough to retain them? Recent polls show that “millennials” are becoming increasingly less reliant on cars . Are we going to build a city that meets their needs? If we want to attract and retain impressive people, we’re going to have to build an impressive city. Edmonton benefits from the oil industry. There’s no denying that a lot of our prosperity can be attributed to the revenue generated by oil. I’ve heard Jim Prentice say numerous times that” if you are in the energy business, you’re in the environment business”. But what does that look like? Cycling is one practical way to get cars (and their accompanying pollution) off of the roads. 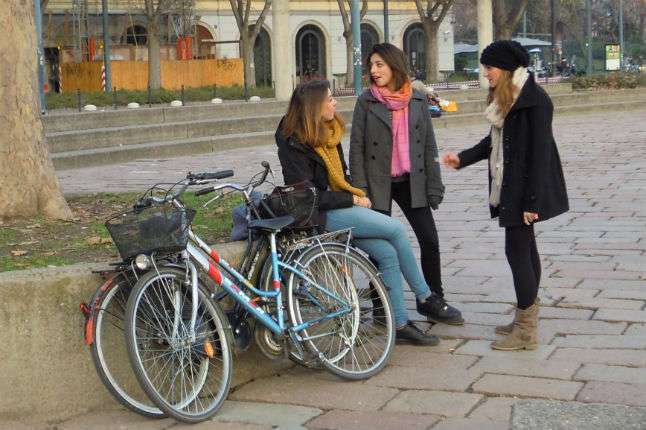 Bike lanes make that process easier by creating safe space for people who may be skeptical. Within the global context, we need to demonstrate that we are doing our part in taking responsibility for the environment. Edmonton is already leading the way in waste management and environmental responsibility – bike lanes fit well with our current endeavours. These were just a few points of many that support why bike lanes should be built in Edmonton. Before I conclude, I’d like to share why I, personally, want bike lanes. For starters, I just love the way biking makes me feel. My mental health has improved. I am in the best shape of my life. I am more connected to my community. Edmonton has been so good to me. I love this city and all of the amazing things I’ve been able to be a part of. Between my job, my personal life, and the different extra-curricular initiatives I’m involved in, it is safe to say that on many fronts I am extremely fulfilled and happy that I made the choice to move here. But there are some non-negotiables for me. 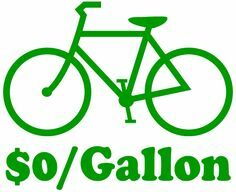 I want to be able to get around my city without needing a car, and I want to be able to do it safely. I don’t want to have to constantly battle with cars for space on the road. I’m a driver as well and I am guilty of having some close calls with cyclists in the past. Bike lanes keep both drivers and cyclists safe. I am increasingly becoming conscious of the impact I am making on the environment, and cycling is one way for me to take some responsibility. Part of my increased interest in environmental responsibility can be attributed to my realization that I will have kids one day. If we keep going in this direction, our future generations will suffer for our poor decision making. Bike lanes won’t be a deal breaker, but they’ll certainly make a difference. Thinking about my unborn children also makes we think about whether I want to raise them here. Will I allow them to bike to school in the winter? Will they be safe on our roads? As I said before, I love Edmonton. It’s grown on me tremendously. As trivial as it sounds, having safe bike infrastructure will play a role in my choice to commit to this city. I want to buy my first house here. I want to bike with my kids to school here. I want to grow old here. I want to stick around, Edmonton. I want you to be my home. Next Post yegsnowfight: We made something, Edmonton.